Comments: Rafael Kubelik was definitely one of the "4 K's" of EMI, and nearly all of his early ASD stereo recordings fetch high prices. You may be groaning to yourself, asking, "Another Russian album??" Yes, another Russian album, because Russian orchestral music is fantastic. 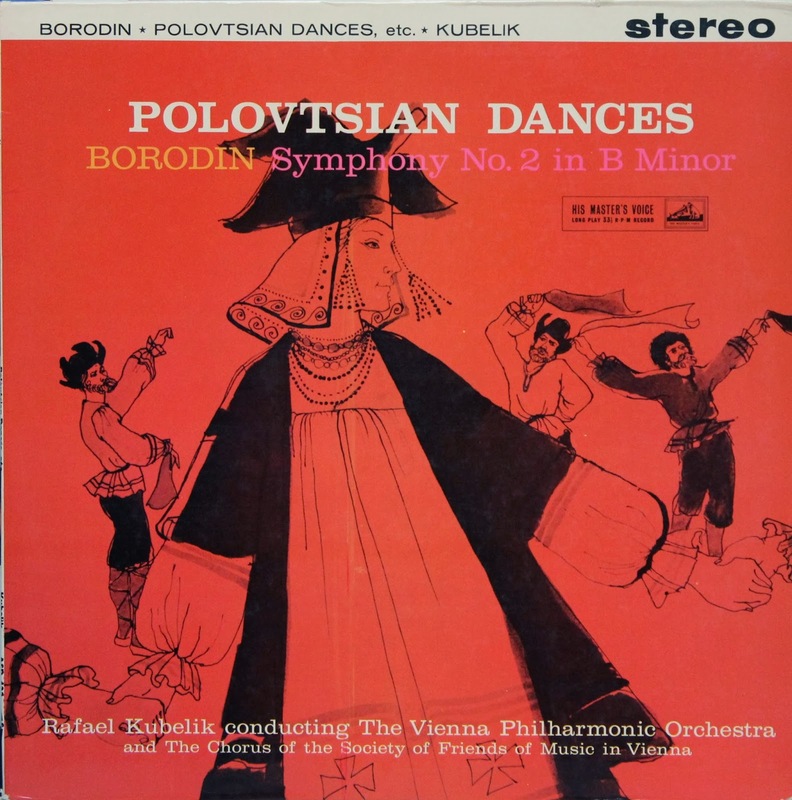 On this LP, we have a fine pairing of Borodin's Polovtsian Dances and his Symphony No. 2 in B Minor. Both are given dynamic performances. 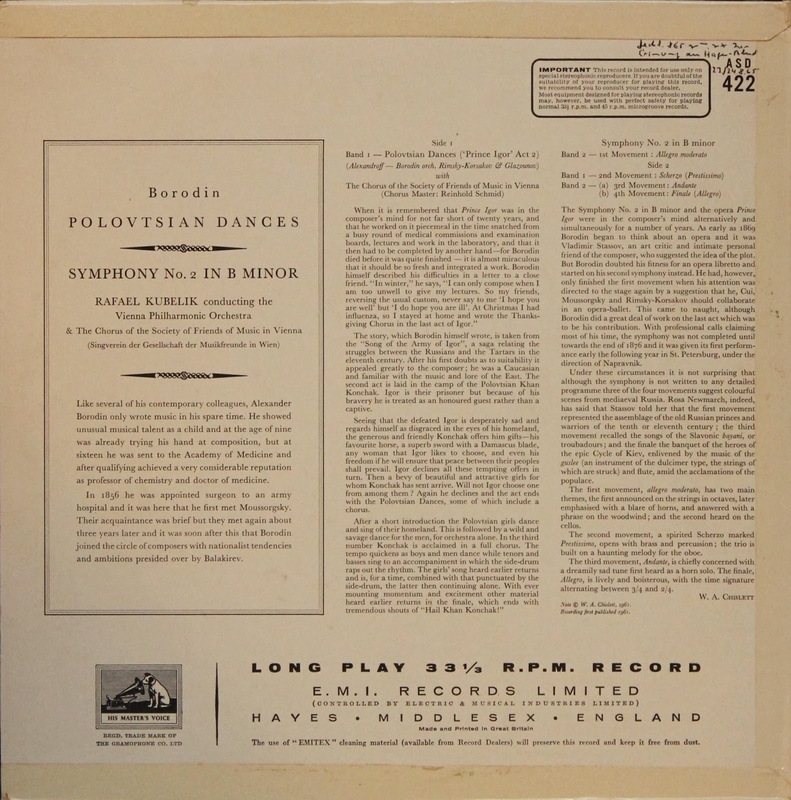 There's a lot of competition for the Polovtsian Dances, not the least from the likes of George Szell and the Cleveland Orchestra (Columbia SAX 2490, reviewed here at http://milestomozart.blogspot.com/2013/03/sax-2490.html), von Matacic and the Philharmonia (Columbia SAX 2327, reviewed here at http://milestomozart.blogspot.com/2013/08/matacics-excellent-russian-album.html), Georg Solti and the LSO (Decca SXL 6263), and Antal Dorati and the LSO (Mercury SR 90265), but this one holds up well. There is less competition as far as the Symphony No. 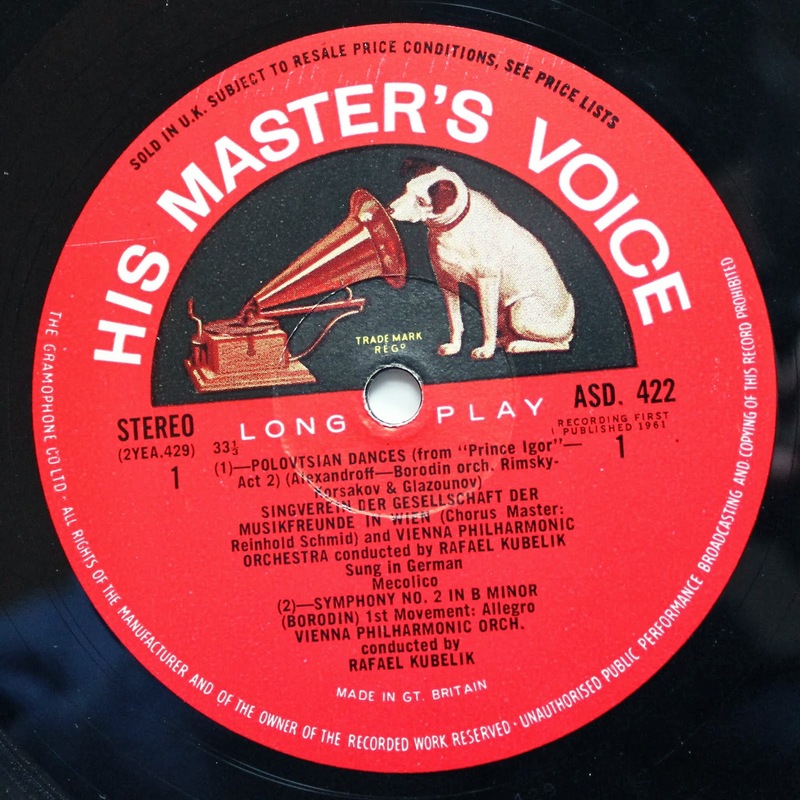 2 is concerned, with Jean Martinon's account with the LSO (RCA LSC-2298, recorded by Decca) being the closest that I can think of. This Kubelik record is quite enjoyable, and although I would not exactly describe the sound as "demonstration quality", it is an excellent example of these treasured tube recordings and worthy of a 5/5 from my perspective. The soundstage is quite wide with nice imaging. Bass doesn't quite get visceral but is respectable. My measure for this is the timpani part leading up to and opening the General Dance movement of the Polovtsian Dances. I was lucky to find my copy last year on Ebay and fortunately didn't have to break the bank to get it. As you can see, I've got the second pressing and not the coveted white/gold first pressing, but in all honesty, I am perfectly satisfied. If you can find a second pressing, pick it up with the confidence that you will be pleased with your acquisition! you're missing the vaunted london blue back! 1 of the top blue backs. Don't worry - I'm planning on reviewing that one (the FFSS) in the next week or two.